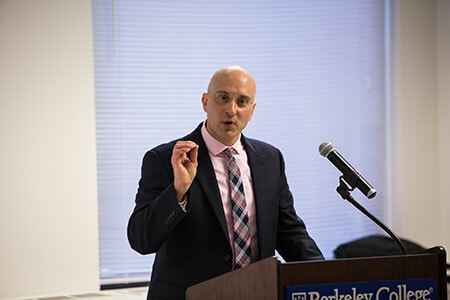 Photo Caption A: Keynote Speaker Jeffrey Anderson, PhD, Dean, School of Business and Liberal Arts and Sciences, SUNY Cobleskill, addresses educators at the 5th Annual Conference of the Consortium for Critical Reading, Writing, and Thinking (CCRWT) at Berkeley College in Midtown Manhattan on October 27, 2017. His address, “Practical Wisdom, Experiential Learning, and the Good Life,” acknowledges how children’s stressful experiences and toxic environments growing up impact how and what they learn. In her opening remarks, Heather Klomhaus, PhD, English, Berkeley College School of Liberal Arts, and Conference Director, said, “As professors, instructors, and administrators, we are united in one goal: to improve the minds and lives of our students. We work tirelessly for their success. In a world that seems increasingly unstable, our dedication to this goal never falters or alters. “… Rare is the uninterrupted time to discuss pedagogical philosophies, approaches and challenges with colleagues. This conference is the remedy … because today we connect across disciplinary and institutional borders and explore what it means to be agents of stability and transformation in higher education,” she added. Photo Caption B: Byron K. Hargrove, PhD, Humanities and Social Sciences, School of Liberal Arts, Berkeley College, and Director, Berkeley College Honors Program (left), presented a workshop on Simulating a “Best Company” Team Project in a Human Relations Course, at the 5th Annual Conference of the Consortium for Critical Reading, Writing, and Thinking hosted by Berkeley College in Midtown Manhattan on October 27, 2017. More than 60 presenters from 18 colleges and institutions of higher learning in the U.S. participated. Conference Committee members included faculty from Berkeley College, Iona College, Monroe Community College and Sacred Heart University. Conference presenters included faculty from the institutions mentioned above, as well as those from Ball State University, Blinn College, Colorado Technical University, Cengage/Quincy College, Columbia University Teachers College, Long Island University - Riverhead, Passaic Community College, New York City College of Technology – CUNY, Pace University, Queensborough Community College, SUNY Cobleskill, Texas Woman’s University, University of Missouri, and University of New Haven. In the session titled, “Beyond the Discussion Board: The Online Classroom as a Laboratory for Learning,” Richard Schultz, PhD, English, Berkeley College School of Liberal Arts, was one of four presenters who gave examples of how faculty can create their own “teaching objects” by combining their recorded lecture segment with relevant art, graphics or historical pictures and music to create an engaging learning experience for students. 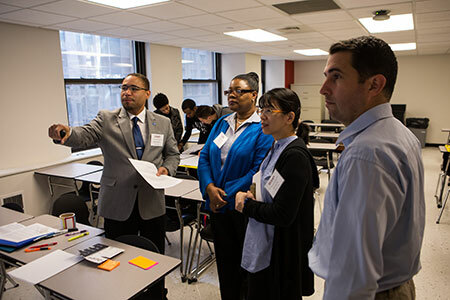 Learning objects like these at Berkeley College are a collaboration between faculty and the Online Faculty Support Team. Berkeley College has three campuses in New York – Midtown Manhattan, Brooklyn and White Plains. In New Jersey there are five campuses – Dover, Newark, Paramus, Woodbridge and Woodland Park. Berkeley College Online® serves a global population. For four consecutive years, U.S. News & World Report has named Berkeley College among the Best Colleges for Online Bachelor’s Programs and among the Best Online Bachelor’s Programs for Veterans. The website address is www.BerkeleyCollege.edu.